This post was originally posted on December 10, 2009. 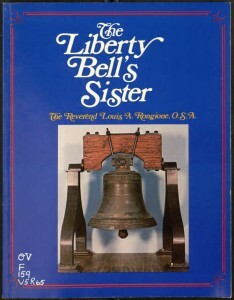 A recently digitized title from the Villanova Digital Collection, The Liberty Bell’s Sister by the Rev. Louis A. Rongione, OSA, provides a history and overview of the companion to the Liberty Bell that once rested in Falvey Memorial Library and now resides in the Augustinian Heritage Room of the Saint Thomas of Villanova Monastery. The history of the bell started on October 16, 1751 when the Pennsylvania Assembly voted that a bell weighing 2000 pounds costing between 100 and 150 pounds (sources disagree on the specific cost – ed.) should be purchased from Whitechapel Bell Foundry in London and then be provided for use in the new State House that was later called Independence Hall. That historic bell cracked upon its first testing. It was felt by that same governing body that because of the need to recast twice after cracking, and the bells poor tone quality, a replacement should be purchased. A bell of the same weight and cost was then ordered. In the summer of 1754 the Liberty Bell’s sister arrived in Philadelphia. On August 13, 1754, however, the Pennsylvania Assembly voted not to replace but to keep both bells as the populace who once found the Liberty Bells’ tone annoying had grown accustomed to it. The original bell was hung in Independence Hall and the Sister Bell was hung on a special cupola in front of her, attached to the State House Clock, to toll the hours. She performed this task from 1754 to 1830, except for a brief period of time during the Revolutionary War. Both bells rang for special occasions. One such occasion was the reading of the Declaration of Independence, July 8, 1776. The Sister Bell is no stranger to political intrigue. On September 14, 1777 British forces were threatening invasion and then occupied Philadelphia. The bells were smuggled to secret location in Allentown to prevent the enemy from melting them down and using them for ammunition. The British left Philadelphia June 27, 1778 and the sisters were returned to their home. In 1830 the City of Philadelphia kept the original bell and sold the Sister Bell and Stretch Clock to Reverend Michael Hurley, O.S.A., Pastor of Saint Augustine’s Church, 4th and Vine Streets, Philadelphia. On May 8th 1844 St. Augustine’s Church was burned to the ground by members of the Native American Party. The clock, library, paintings were totally destroyed and the bell cracked into pieces in the fire. Her fragments were gathered and given to Joseph Bernhard of Philadelphia for recasting. 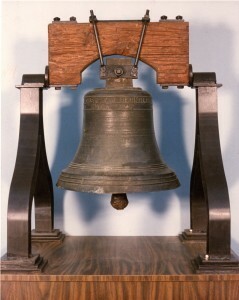 In 1847 the Sister Bell was recast but she was greatly reduced in size. She was sent to Villanova College founded in 1842 by the same Augustinian Fathers who served St. Augustine’s Church. From 1847- 1917 the Sister Bell hung in a locust tree and was used to call the students to class, chapel and their meals. In 1917 she was sent to Jamaica Long Island and was used in the steeple of St. Nicholas of Tolentine Augustinian Church, but on September 20, 1942 she returned home to Villanova for the inauguration of the Centennial year 1942-1943. Currently the Sister Bell has found a home in the Augustinian Heritage Room. She may be seen by appointment by calling the Rev. Martin L. Smith, OSA: 610-864-1590.